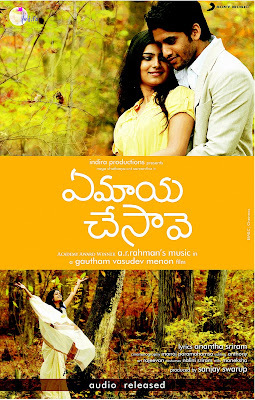 hii guyz...recently I watched Yem Maya Chesave..I'm here again 2 share my review on dis movie. Yem maya chesave..by da name we can analyze..,the title is for sure opted.Earlier Indira productions thaught of keepin diff titles lik jessie etc.Yeah nijangane Samantha(actress)mana andari Boyz ni maya chesindhi.I'm quiet sure amg da 10 boyz ..7 opt Samantha as best as of nw.Mari ala maya chesindhi movie lo.May be datz da reason y she was offered 2 act against Prince Mahesh Babu and Jr.Ntr .She is acting in Brundavanam opp Jr.N.T.R nd unamed proj opp Prince Mahesh. Verastile,andriot,intellectual person"Gautham Menon"(go 2 flash back,fr his previous movies lik Gharshana(kaka kaka in Tamil),Raghavan,Surya s/o of Krishna). Da story goes around Karthik(Naga Chaitanya) whoz a hindu and Jessie(Samantha) whoz a christian,nd hw da religional lov bonds.On da first sight,karthik falls in love wid Jessie.He wants 2 do anything for jessie.Karthik proposes jessi,but jessie rejects da lov,stating reasons lik dat she is 2 yrs elder dan karthik,Her father does'nt lik films(bcaz Karthik prof is asst dir).But,Jessie falls in lov wid Karthik unknowingly.Here director rightly amplified da character of jessie,where we can see most of da jessie characters in da real world(Gals alaney untaru mari..not all.. but we can say 60%..I hope galz v'll not shw anger on me...lol). Jessie had crush on Karthik,but does'nt want 2 reveal 2 karthik.She says sometimes she loves karthik,nd again says I don't lov .She breaks da lov bcaz she comes up wid all illogical reasons.So hw they meet again nd hw story ends is all abt da movie.First half of movie is intersting nd 2nd half is bit sloggy.Krishnudu added some flavour 2 da movie wid some comedy. Comin 2 other aspects of da movie,Music wch was composed by our greatly,down 2 earth oscaree A.R Rehman.Songs are too gud.Mixing of some malayali words in da songs(Bcaz Jessie is a malayali in da movie),background music ..hmm exqusite.Songs are pleasant ,mesmerizing nd boils alwayz in u r tongue (whr evr u go,wt evr u do(there may be some bathroom singers naa..lol)After 1 nd half year A.R is bak wid some pleasant music(As he'z buzy in hollywood yaar). Other factor is picturisation..hmm we can say keka,turumu,scintillating.Of course Gautam movies lo picturisation ela untundo mee andariki telesey untundi if u r a movie freak.Sound clarity,clean nd well versed sights appear on da screen..hmm we can say marks da best.All techinal aspects in da movie are excellent.Costumes are good. 4.When Karthik visits Jessie in da nite thru boat in kerala..
5.Church incident whr Jessie runz away frm marriage. 1.May be itz gud if director hv extended da character of Krishnudu. 3.second half is draggy,of course intersting but depends on diff people. As a movie buff,I can say dat dis movie connectes mostly to lovers..lol.I can assure you dat out of 10 couples,all v'll connect dis movie 2 their eariler flash bak incidents(wt guyz am I wrong ).All in all movie is excellent.